On June 7 1917 Major Willie Redmond, MP for East Clare, was killed in action leading the Royal Irish Brigade to victory at the Battle of Messines Ridge at Ypres. A member of the Irish Parliamentary Party (his brother John was party leader ), he had represented East Clare at Westminster for 25 years. At 53 years of age Redmond was too old to be a soldier. But he was convinced that an Ireland loyal to the Crown would succeed in achieving Home Rule, and so he joined the Irish troops at Flanders. The Irish Parliamentary party believed that there would be a sympathy vote for Redmond, and quickly nominated Patrick Lynch, a barrister and crown prosecutor by profession, as their candidate. When Lynch arrived in Ennis he was met with enthusiastic support. His election posters declared: ‘CONSCRIPTION - Nothing but the strenuous opposition of the Irish Party had stopped conscription in Ireland.’ A procession through the town was preceded by a marching band. The IPP were probably under the illusionment that everything was fundamentally the same. The Easter Rising had passed off without much note in Clare. It was condemned as being misguided by church leaders. The Bishop of Killaloe, Dr Fogarty, said: “I bewail and lament their mad adventure …they died bravely and unselfishly for what they believed foolishly was the cause of Ireland.” Political thinking, however, had rapidly changed. Following the execution of its leaders, the tide of public opinion had turned dramatically. Almost overnight the executed leaders were perceived as heroes. When the East Clare election was mooted, and the IPP was confident of an easy victory, Sinn Féin had a winning candidate in mind. 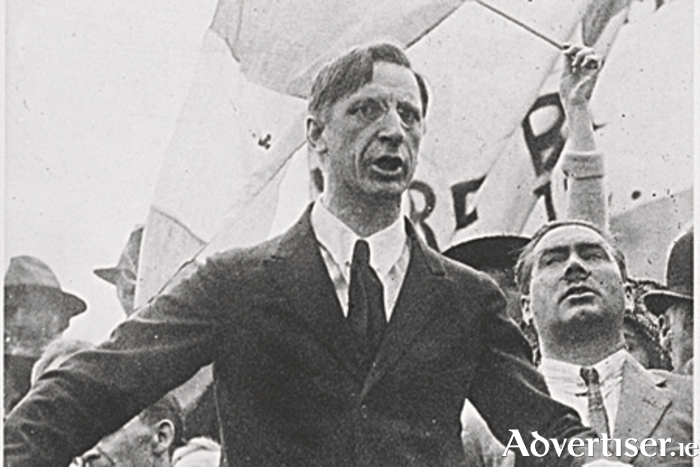 Éamon de Valera was practically one of their own. Born in New York in 1882 to immigrants Vivian de Valera, (originally from Spain’s Basque country ), and Catherine Coll, from Bruree, Co Limerick, Éamon was sent back to his mother’s home as a small child. He went to the local school, played with the local children, was educated at the CBS in Charleville, from which he walked the seven miles home every evening. He was fortunate to receive a scholarship to Blackrock College, Dublin. He became a school teacher, and lecturer. He grew passionate about the Irish language, and was immediately smitten by his Irish teacher Sinéad Flanagan, whom he married. He was appointed director of the summer school in Tawin, an Irish speaking island in Galway Bay, for a three year term in 1911. He joined Sinn Féin and the Volunteers where his leadership qualities were quickly admired and trusted. He was 33 years old, a lecturer in a teachers’ training college, at the time of the 1916 Rising. He was the commander of a unit of Volunteers at Boland’s Mills during the Rising. Condemned to death, but reprieved due to his American birth, he was the senior commandant to survive. Following a year of militant defiance inside English prisons (he was in four: Dartmoor, Lewes, Maidstone and Pentonville ), he emerged a symbolic hero, and was accepted with acclamation as the leader of the forces for independence. Yet de Valera would take some convincing to run. He had made it clear that he was opposed to Volunteers getting involved in politics. He saw them as soldiers not politicians. But on his release from his final prison he was handed a telegram telling him he had been selected as the candidate for East Clare. Not fully aware of the change in political temperature that had happened in Ireland since his imprisonment, Dev was advised by his friend Patrick McCartan to wait a week before deciding, to give him a chance to see the ‘new spirit in the land’. When the prisoners arrived back in Ireland they received a huge welcome from enthusiastic crowds. Dev was convinced that there would be support for his candidature. He made one interesting precondition. He insisted on taking Eoin MacNeill with him, a move that did not meet with approval among the hot heads in Sinn Féin and the Volunteers. MacNeill, who had established the Irish Volunteers in 1913, and served as its chief-of-staff, was criticised for cancelling the Easter Rising at the last moment as he feared the rebellion was ill prepared. He was proved wrong; but Dev, recognising McNeill’s value, reached out the hand of friendship. He also saw that there was no appetite in the country for a continuation of violent revolution at that time. McNeill was the perfect moderate to calm fears of continued violence. NOTES: *More than 200,000 Irishmen fought in the Great War in several theatres, of whom 30,000, or if you include those who died serving in other Allied armies, 49,400, died. I am using information gleaned from an article by Fidelma Mc Donnell in the Clare Champion September 26 2003, and ‘The East Clare By -Election and the Rise of a Political Leader,‘ Century Ireland. ‘MEN OF CLARE? Women had no vote in 1917. They had to wait another year before universal suffrage was granted.